Ask yourself one simple question: How would your life be better if you were completely mortgage free? 1-Would you be able to retire sooner? 2-Would you be able to travel more? 3-Spend more time with kids and grandkids? 4-Would you be able to invest more money for your retirement? If you answered yes to even one of these questions, you owe it to yourself to read this eBook. 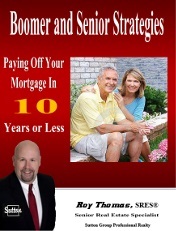 In this eBook I've listed 14 highly effective strategies that you can immediately start to use to reduce your mortgage. To request your copy of this eBook simply fill in the info below and your copy will be instantly sent to you via email. Or if you prefer you can call me at 902-497-3031 and I’ll send you a printed copy in the mail. How did you hear about Roy? All Listings MLS® Unless Otherwise Stated. Roy Thomas reserves the right to refuse, for any reason or no reason, any request for Information, Reports, Home Evaluations, Newsletters etc.